For more information and contact please visit the BERGAMI LAB. Accumulating evidence suggest that mitochondrial energy failure at synaptic terminals may be central to neuronal degeneration. However, whether mitochondria directly contribute to synaptic homeostasis or may even possibly favour neuronal/synapse regeneration in the adult brain has been elusive. 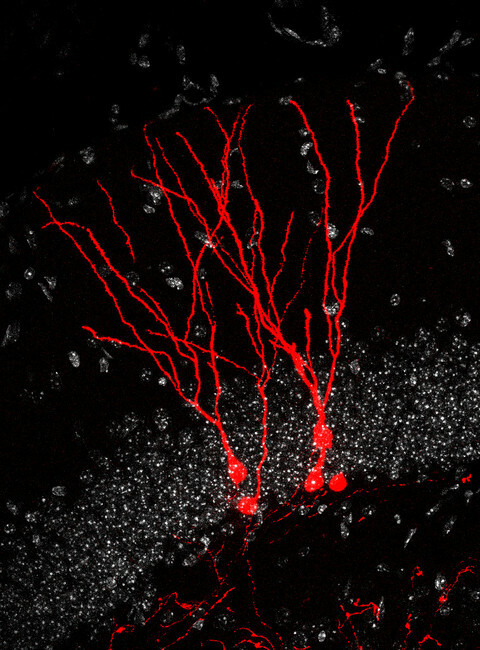 In this project, we specifically focus on key regulators of mitochondrial fusion dynamics in newly-generated neurons in vivo to pursue the central question whether mitochondria contribute to aspects of cellular plasticity underlying the remarkable synaptic and connectivity remodelling of adult hippocampal circuits. Bergami, M., Masserdotti, G., Temprana, S., Motori, E., Eriksson, T.E., Göbel, J., Yang, S.M., Conzelmann, K.K., Schinder, A.F., Götz, M. and Berninger, B. (2015). A critical period for experience-dependent remodelling of adult-born neuron connectivity. Neuron 85, 710-717.